Malabar fifth-graders crowd around Richard Jenkins for ideas about the superheroes they are creating. 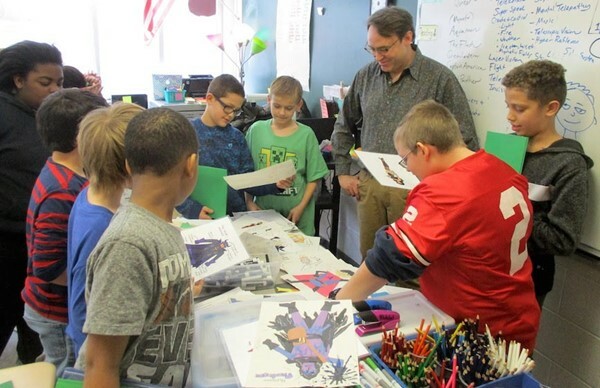 While Richard Jenkins had Malabar Intermediate School fifth-graders drawing superheroes Tuesday morning he snuck in a heavy dose of literacy without them realizing it. Jenkins, an Oklahoma-based cartoonist and illustrator, also is a John F. Kennedy Center teaching artist. He was in Mansfield to lead an evening professional development workshop for teachers at the Renaissance Theatre centered on using super-powered stories for character and story creation. Before the workshop Jenkins worked with three classes at Malabar and an afternoon class at Woodland Elementary. At the start of his presentation in Shannon Pohlabel’s fifth-grade classroom at Malabar, Jenkins explained to students that he wears hearing aids. Several hands went up before one boy answered that a synonym is a word that means the same thing as another word. Working from folders already on their desks, students followed Jenkins’ lead as he drew shapes and ideas on the white board at the front of the classroom to create a superhero and a super villain. Some kids chose square bodies, others round, triangular or even peanut shapes to create their own hero and villain. They used varied shapes for heads and created poses with their characters’ arms up or down. As he thought about what to name the characters he had drawn on the white board, Jenkins prodded the kids to think about synonyms. “What other words come to our mind when you hear ‘flight?” he asked. Responses included soaring, streaking, wings and altitude. Each table, which included either three or four students, also had a thesaurus which Jenkins urged the kids to use. Responses included bright, blazing and scorching. Pohlabel’s students will complete their superheroe and super villain drawings over the next couple of days. Jenkins offered tips on costumes and facial details. “And think about what kind of personalities your characters will have,” he said. After class, Jenkins explained that he was born with a hearing impairment. Jenkins’ workshop presentation was designed to guide teachers through the process of building students’ expressive and cognitive capacities and unlocking their story-making potential by using cartooning. A published writer and arts and education consultant, he was awarded the Teaching Artist Fellowship from VSA (Very Special Arts) in 2009 for his exemplary work with special needs students.